Well, another Worldwide Developers Conference kicked-off and another Stevenote wrapped up. 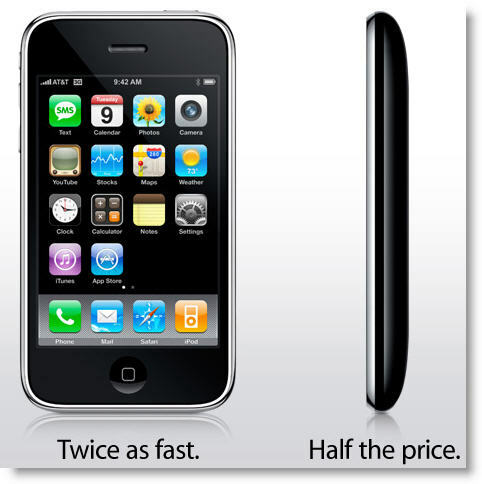 The announcements were pretty well covered in the previous week by the Apple rumor squad, the *big one being the release of the iPhone 3G next month (July 2008). Among other things, It has a faster connection, built-in GPS, and a price tag that is about half of what the previous generation sold for. Still AT&T Only. North Dakota Still Out of Luck. When I wrote about the first iPhone announcement 1 1/2 years ago, I mentioned how it was going to only be available for the AT&T (then Cingular) wireless network. This is still the case, and the wireless provider still has no presence in North Dakota, so us North Dakotans are out of luck yet again. With Verizon’s purchase of Alltel last week, North Dakota will effectively have one statewide wireless provider, creating a monopoly for Verizon in the state. And while I’ve had terrific luck with their service and coverage, more competition is always better. So, maybe we’ll see AT&T move in to challenge them, but I’m not holding my breathe. I think the best chance of us seeing an iPhone in the upper midwest would be for Apple to make a CDMA compatible version. But, this could be years out, if ever, due to their exclusivity contract with AT&T. Or, maybe our dreams will finally be realized when all the wireless carriers migrate over to Long Term Evolution (3GPP LTE) in a few years. Actually, for about 6 months now, AT&T has had native coverage in ND, but only if you live in the likes of Fargo/Bismarck/Dickinson. There is still roaming available up and down the interstates, but anything in a rural area is still out of luck. So not all of North Dakota is out of luck, just those who don’t live in a large city. LTE can’t get here fast enough. Thanks for that info Shawn. I didn’t realize they increased their coverage in the state. I guess that’s progress, right? AT&T still will not sell a plan in ND. They only use partner towers here. Isn’t the AT&T deal exclusive for 5 years? That’s what I originally thought.